Chromoendoscopy is an adjunctive endoscopy technique that involves spraying of dyes on the gastrointestinal mucosal surface to identify specific epithelia or to enhance mucosal surface characteristics of the gastrointestinal epithelium. It is performed to aid in the detection of subtle lesions or to allow directed targeting of biopsies to increase the yield of endoscopic diagnostic accuracy. 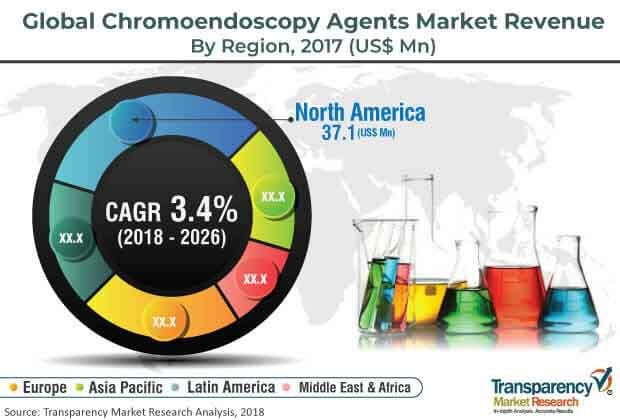 The global chromoendoscopy agents market was valued at US$ 108.9 Mn in 2017 and is anticipated to reach US$ 146.5 Mn by 2026, expanding at a CAGR of 3.4% from 2018 to 2026. Rise in prevalence of gastrointestinal diseases, technological advancements in imaging techniques, surge in awareness among people about preventive measures of cancer, and increase in the number of endoscopy procedures are factors projected to propel the global market during the forecast period. The global population is ageing rapidly. According to the WHO, nearly 2 billion people are expected to be aged 60 and above by 2050, which is around 16.7% of the global population. The population in developed countries such as those in Western Europe, Japan, and the U.S. is ageing at a high rate. Some reasons behind it are better health care infrastructure & polices and adoption of advanced medical techniques. Additionally, access to various diagnostic and treatment services has improved in these countries in the past few years. This, in turn, has increased the life expectancy of the overall population. Treatment procedures such as colonoscopy, lung surgeries, hip & knee implants, gastrointestinal endoscopic procedures, and bariatric surgeries are common among the geriatric population. A rise in the geriatric population leads to high rates of ailments. These factors are likely to drive demand for and adoption of endoscopic devices and agents. The global chromoendoscopy agents market has been segmented based on product type, application, end-user, and region. In terms of product type, the absorptive agents segment is projected to account for major share of the market. Absorptive agents improve the recognition of minute changes in the surface pattern by enhancing the contrast of raised and deepened area. This facilitates the visualization and detection of dysplastic and malignant lesions in the gastrointestinal tract. Based on application, the colorectal cancer segment held major share of the market in 2017. The segment is anticipated to expand at a higher CAGR than the other segments during the forecast period. Chromoendoscopy agents have proven to be effective in the detection and visualization of colon neoplasia. In terms of region, the global chromoendoscopy agents market has been segmented into North America, Europe, Asia Pacific, Latin America, and Middle East & Africa. Developed regions such as North America and Europe accounted for leading shares of the global market in 2017. Large patient population and presence of major medical devices companies in these regions can be attributed to high share of these regions. Moreover, rise in prevalence of gastrointestinal diseases and increase in the geriatric population drive the chromoendoscopy agents market in these regions. The market in Asia Pacific is projected to expand at a high CAGR owing to rapidly improving health care facilities in countries such as India, China, South Korea, and Malaysia. China dominated the chromoendoscopy agents market in Asia Pacific in 2017. The market in India is anticipated to expand at a significant CAGR during the forecast period. Furthermore, increase in investment by leading market players and health care providers is expected to fuel the growth of the market in the region. These factors are likely to drive demand for chromoendoscopy agents in the near future. The market in Latin America and Middle East & Africa is projected to expand at a steady pace during the forecast period. Prominent players operating in the global chromoendoscopy agents market include Cosmo Pharmaceuticals NV, Provepharm Life Solutions, Enzo Life Sciences, Inc., Sisco Research Laboratories Pvt. Ltd., HISTALIM, Merck KGaA, Thermo Fisher Scientific, Inc., and LobaChemie Pvt. Ltd. This report on the global chromoendoscopy agents market analyzes the current and future prospects of the market. The report comprises a comprehensive executive summary, including a market snapshot that provides overall information of various segments. The research is a combination of primary and secondary researches. Primary research formed the bulk of the research efforts along with information collected from telephonic interviews and interactions via e-mails. Secondary research involved study of company websites, annual reports, press releases, stock analysis presentations, and various international and national databases. The report provides market size in terms of US$ Mn for each segment for the period from 2016 to 2026, considering the macro and micro environmental factors. Growth rates for each segment within the global chromoendoscopy agents market have been determined after a thorough analysis of past trends, demographics, future trends, technological developments, and regulatory requirements. A detailed qualitative analysis of factors responsible for driving and restraining the market and opportunities has been provided in the market overview section. The report also provides insights into the key trends of the chromoendoscopy agents market. The report includes market attractiveness analysis of the major segments that provides a thorough analysis of the overall competitive scenario in the global chromoendoscopy agents market. Market revenue in terms of US$ Mn for the period between 2016 and 2026 along with the compound annual growth rate (CAGR %) from 2018 to 2026 are provided for all the segments, considering 2017 as the base year. The year-on-year growth of the global chromoendoscopy agents market for each segment is also reflected. Additionally, market-related factors such as favorable reimbursement scenario, expanding applications of chromoendoscopy agents, and historical year-on-year growth have been taken into consideration while estimating the market size. Based on product type, the global chromoendoscopy agents market has been segmented into absorptive agents, contrast agents, and reactive agents. In terms of application, the global market has been classified into esophageal, gastric, and colorectal. Based on end-user, the global chromoendoscopy agents market has been categorized into hospitals, ambulatory surgery centers, specialty clinics, diagnostic centers, and others. In terms of region, the global chromoendoscopy agents market has been segmented into North America, Europe, Asia Pacific, Latin America, and Middle East & Africa. Additionally, the regions have been further divided into major countries/sub-regions. These include the U.S., Canada, the U.K., Germany, France, Italy, Spain, China, Australia & New Zealand, Japan, India, Brazil, GCC Countries, South Africa, Israel, and Mexico. The report also profiles major players in the global chromoendoscopy agents market based on various attributes such as company overview, financial overview, SWOT analysis, key business strategies, product portfolio, and recent developments. Key companies profiled in the report include Cosmo Pharmaceuticals NV, Provepharm Life Solutions, Enzo Life Sciences, Inc., Sisco Research Laboratories Pvt. Ltd., HISTALIM, Merck KGaA, Thermo Fisher Scientific, Inc., and LobaChemie Pvt. Ltd.